It was shaped and fried up (with the addition of lots of butter – which, to me, somewhat defeats the purpose of a lab grown hamburger patty – because surely part of the reason to do this is to get away from the ethical concerns of animal husbandry and while dairy cows aren’t slaughtered for hamburgers, I don’t think their living conditions are any better than the average meat cow, so unless the butter was also lab grown I don’t think you’ve achieved independence from the commercial meat industry) earlier this week in London. Apparently even the addition of lots of butter couldn’t save the patty from being dry and somewhat reminiscent of a hockey puck. According to the tasters it had the texture and mouth feel of meat, while tasting like ‘an animal protein cake’. The next hurdle, according to the researchers who gave us this somewhat dubious advance in science, is getting fat into the meat. As far as I can tell this was mostly an experiment to see whether it could be done at all, so in that sense I guess it was a success. The wider implication is whether lab grown (eventually factory grown, I suppose) meat could provide a protein source for the growing global population without the environmental impact, and ethical issues, associated with the more traditional methods of meat production (i.e. animals). Although, at more than $30/lb to produce commercially (not to mention the $325,000 they spent to produce the test version), I don’t think the traditional mooing & cud chewing source of hamburgers will be safe from the public appetite anytime soon (or, put another way, I don’t think the beef industry needs to worry about their bottom line for a while). Personally, I’m not entirely convinced this is a step forward, or at the very least I feel like all the scientists involved should take a moment to watch Soylent Green and think about the consequences of their actions. Also, I think I’m just really creeped out by the idea of meat grown in a petri dish. I’d rather either spend the extra money on free range meat, or go vegetarian for my proteins. But who knows, maybe 20 years from now we’ll all be eating lab grown meats and liking it? 20 years ago I wouldn’t have said I’d count broccoli among my favorite foods, so stranger things have happened. Entirely coincidentally Dinner last week was entirely vegetarian (well, okay, I used chicken stock in the soup – but it could have been vegetarian if it had needed to be). I don’t normally bother with straining corn soup. It’s usually so fragile and thin that I find that if you strain it you just end up with colored water. However, the coconut milk gives this soup some body, and if you don’t strain most of it (you reserve some of the puree) then it actually ends up being too thick. Also, straining it gives it this lovely silky consistency. Sweat the leeks and smashed garlic in the butter until softened, but not browned. Add the curry powder and cook for 30 seconds. Strip the kernels from 8 of the ears of corn (you need about 4 cups of corn kernels). Reserve 4 of the stripped cobs. Tie up the coriander seeds, peppercorns, and ginger in a small muslin bag or tea bag. Trim the dry end of the lemongrass (I usually cut about halfway down the stalk) smash the thick end with the blunt edge of a heavy knife. Add the bouquet garni and the lemongrass to the soup pot. Add the corn, the reserved corn cobs, and stock to the pot and bring to a simmer. Allow to cook for 20 minutes. Remove from the heat, add the coconut milk and allow the mixture to steep for 30 minutes. Discard the lemongrass, corn cobs, and coriander/peppercorn sachet. Puree the soup until smooth. Remove and reserve 1 ½ cups of the puree. Pass the rest of the soup through a fine mesh strainer. Add the reserved puree. Season to taste with salt/pepper/lime juice. Chill overnight. Check the seasoning again before serving (cold food tastes different than hot food). 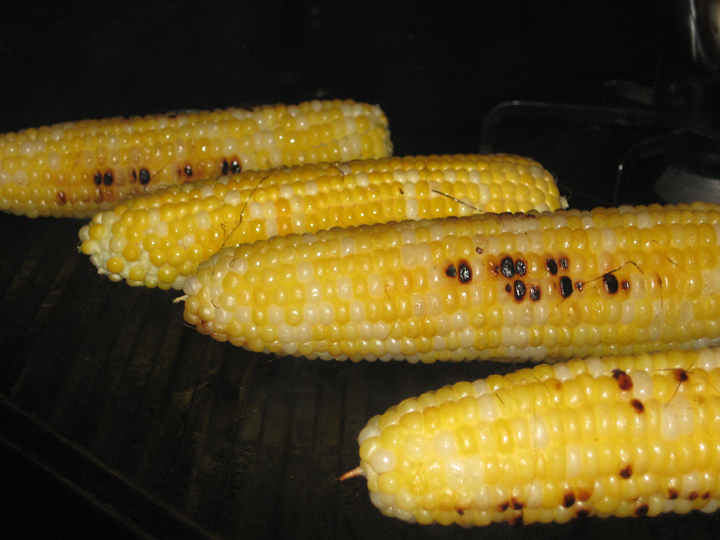 Lightly oil the remaining two ears of corn and char them either in a heavy frying pan, or over a grill pan. Cut the charred kernels from the corn. 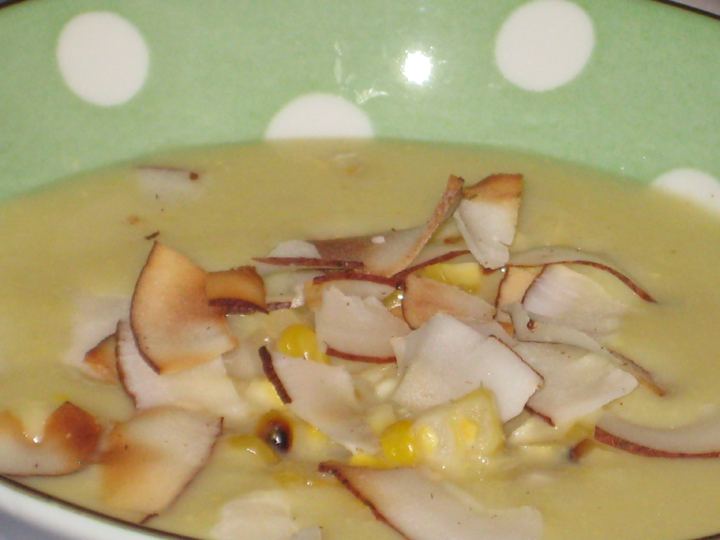 To serve, ladle the soup into bowls, and then garnish with the charred corn and toasted coconut (I got all fancy and actually bought fresh coconut from Whole Foods and created thin slivers from it with a vegetable peeler – but unsweetened dried coconut toasted in a skillet is just fine). * Since I was doubling the recipe I used ½ full fat, and ½ lite coconut milk. I’m not sure I’d recommend all lite coconut milk, I think you need the unctuousness of full fat coconut milk to give this soup its excellent body and texture. This makes a fair amount of dressing – more than you’ll need. I have used leftover dressing to marinate chicken (pork tenderloin would also be good). I have also used it as an actual salad dressing, although you need a fairly sturdy green to stand up to it because it’s a thick dressing – I used it on kale. Preheat your oven to 425. Wrap the mango in foil, and then place on a parchment lined baking sheet and roast for 1 hour, turning over halfway through. Cool. When the mango is cooled, slice it and scrape the flesh into a blender with all the remaining ingredients. Blend until smooth. Thin with a little water if it seems too thick. Adjust seasoning to taste with salt/pepper/red pepper flakes/lime juice. 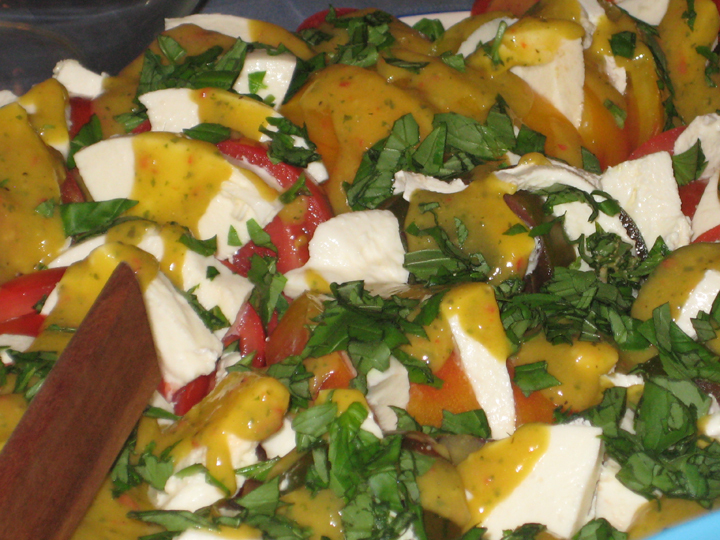 Layer the tomatoes and sliced mozzarella on a plate. Dollop with the roasted mango dressing. Garnish with freshly chopped basil. 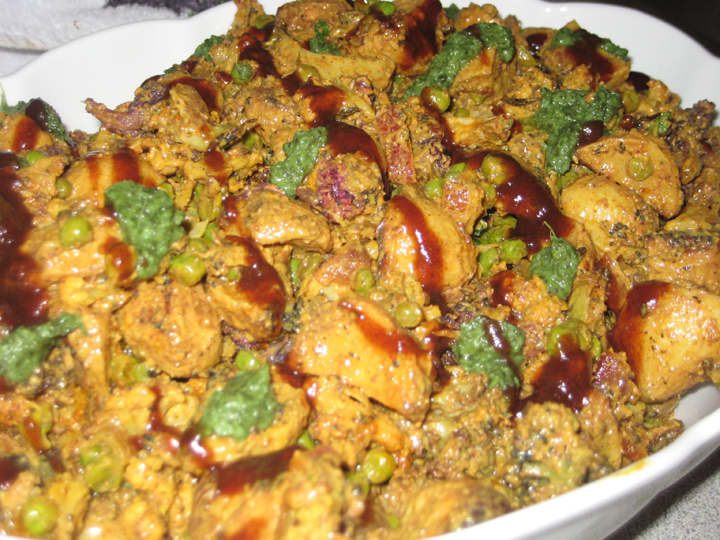 This was a grand experiment in whether I could turn the filling of a samosa into a potato salad and have it be identifiable as samosa-like. It was unexpectedly successful, if possibly more work than I usually want to go to for a potato salad. Place two baking sheets in the oven, and then set it to preheat your oven to 425. Whisk together all the marinade ingredients. Toss the potatoes with half the marinade, coating thoroughly. Toss the cauliflower with the remaining marinade, coating thoroughly. Remove the hot baking sheets from the oven and lightly oil them (paper towels are useful for this). Arrange the potatoes on one sheet, and the cauliflower on the other. Roast potatoes for about 40-45 minutes, tossing every 15 minutes. Roast the cauliflower for 30-35 minutes, tossing every 15 minutes. You’re looking for the cauliflower and potatoes to be cooked through, and a little caramelized/charred. Cool. Place some vegetable oil and mustard seeds in a pan and heat until the mustard seeds pop. Add the onion, and saute until golden. Add the ginger and garlic, and cook, stirring, for 30 seconds. Add the spices, and cook, stirring, for 30 seconds, or until fragrant. Add the peas and a splash of water, and cook for 2 minutes to cook them through (if you’re using fresh peas this will take longer) and water has evaporated. Allow mixture to cool. When the mixture is cool mix it with the plain yogurt and the curry paste (if using – I used it because I thought the sauce needed a little more kick), and then toss with the roasted potatoes & cauliflower. Season to taste with lemon juice, salt & pepper. (optional – drizzle the top with a little of the mint chutney and tamarind sauce to mimic the sauces you get in Indian restaurants when you order poppadums). We went to brunch for a friend’s birthday at one of our favorite upscale fusion dim places – Myers & Chang – a couple of weeks ago. [pause] Okay, so upscale fusion dim sum sounds incredibly pretentious. It’s not, or well it kind is, but in a really positive way. So, for example the menu includes such dishes as bao stuffed with bbq pork, or edamame guacamole with tortilla chips, as well as more traditional fare like hakka eggplant and dan dan noodles. Anyway, it’s really really tasty. When we were there they had a special (which now appears to have made it to the regular menu) of watermelon served with a chili-sugar dip, and we all (well, my end of the table anyway) loved it. This is an attempt at recreating it. Huh, research suggests this is actually called prik glua, and it’s a common Thai street snack. And by research, I mean idle googling. Pulse in a food processor until well combined. 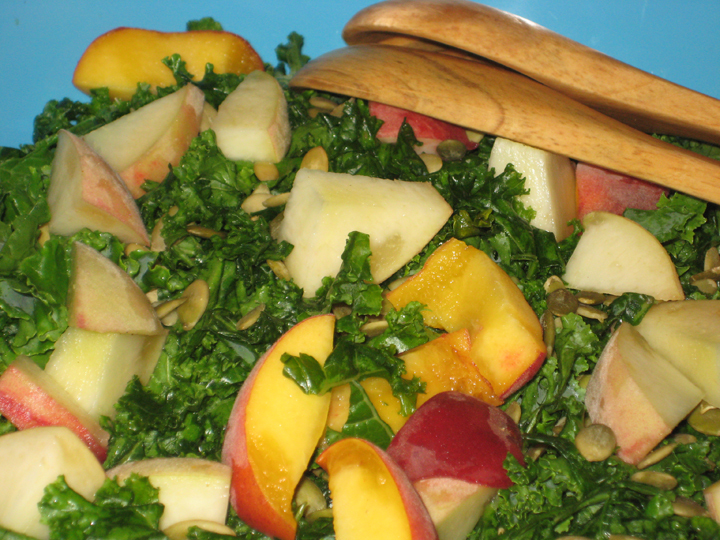 Serve in a small bowl alongside slices of watermelon. Sprinkle abstemiously over the watermelon. Eat. My office labors under the misapprehension that I suffer from an excess of self-restraint. This is mostly because I rarely partake of the leftover trays of pastries, cookies, and cakes that emerge after meetings. What they don’t understand is that I find dry scones unappealing, oily cookies actively off putting, and don’t understand the point of a brownie that doesn’t taste of chocolate. Left alone with a tray of Seven Layer Bars, however, and there will be no self-restraint in evidence. I’ve wondered for a while why catering companies can successfully make Seven Layer Bars when they fail at almost all other baked items. However, having now made them I understand – it’s because they are next to impossible to screw up, and involve very little actual baking per se. The only saving grace to my having found this out is that they also involve a lot of ingredients I’m unlikely to have lying around my house on a random Friday night. Seven Layer Bars apparently also go by the aliases of Hello Dolly Bars, Magic Bars, or Dream Bars. As far as I can tell they were originally developed by Eagle Brand Sweetened Condensed Milk as something to do with their product. They now exist in pretty much any iteration you can think of – if comes in chip or chunk format you can probably add it to these bars. You could replace the butterscotch chips with peanut butter chips, or toffee bits. You could use pecans instead of peanuts. You could add mini marshmallows. The only parts of the recipe that are really essential are the graham cracker crust, the coconut, and the sweetened condensed milk. The rest is mix-and-match at will. My only quibble with this recipe (which is the one that Eagle Brand put out lo these many years ago) is that I think there isn’t enough graham cracker crust. I would probably double the crust next time, both for texture/flavor contrast, but also to give it a little more structure. Grease & line a 9×13 pan (or two 8×8 pans) with a parchment paper sling. Pulse the graham crackers in a food processor until they form a fine crumb. Mix with the melted butter. Pour into the pan and pat to form an even layer. 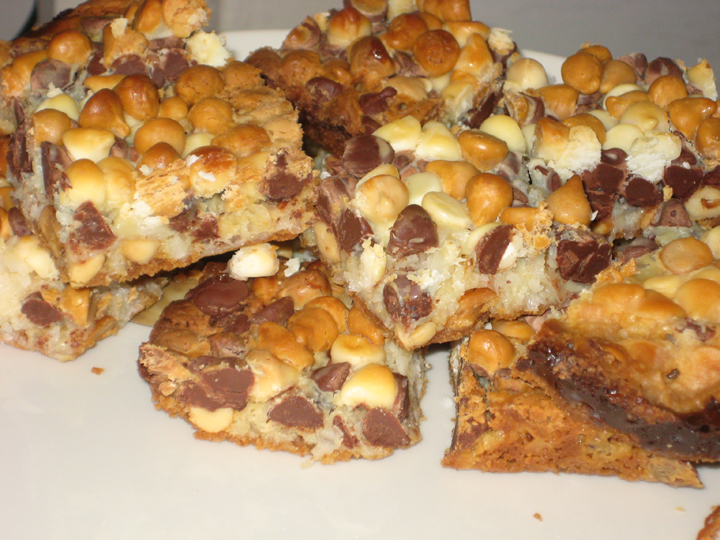 In order sprinkle over the graham crust – peanuts, chocolate chips, white chocolate chips, butterscotch chips, coconut. Drizzle the sweetened condensed milk evenly over the top. Bake for 25-30 minutes, or until the top is golden. Allow to cool in the pan completely. Use the parchment sling to help lift it out of the pan. Cut into small (or large) squares. For the record, fluffernutter sandwiches (peanut butter + fluff for anyone who grew up outside of the US) were not a part of my childhood. Apart from the fact that I don’t think my mother would ever have bought fluff in a lifetime of school lunches, she would also not have considered peanut butter + fluff on white bread to be an acceptable lunch (although, peanut butter +honey absolutely was, and I always loved the way that the honey kind of crystalized in the bread by the time you got to lunch . . . also, cream cheese mixed with raisins & walnuts spread inside pita bread . . . so, actually nutritionally speaking I don’t know that a fluffernutter sandwich would have been all that much worse than some of the things I was taking with me). Anyway, fluffernutter sandwiches were not a part of my childhood lunch experience except as something I watched other people eat. 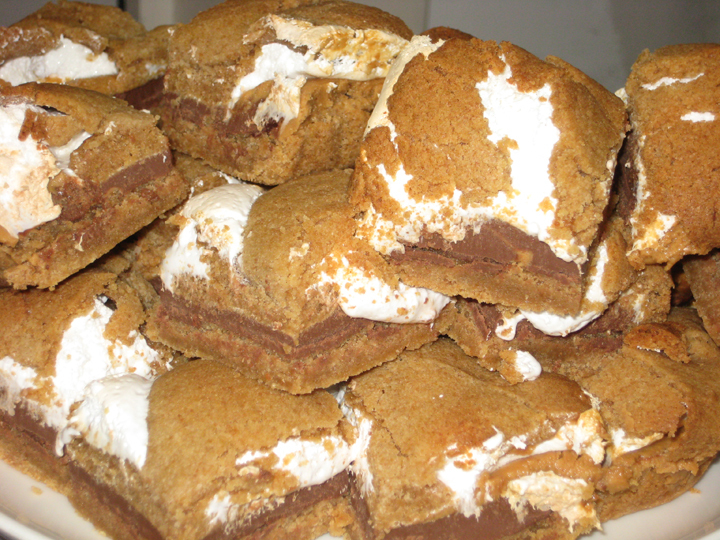 I was looking at s’mores bar recipes, when I came across one that added a layer of peanut butter, and since I basically think anything that combines chocolate and peanut butter is genius, how could I possibly be expected to resist? Apparently I’m not the only one with s’mores on my mind. A friend made s’more ice cream last night (hers was way classier than my version what with the homemade ganache and homemade marshmallows that went into it), and I saw two articles on s’mores variations in my blog feed today. Grease & line an 8×8 pan with a parchment paper sling. Cream the butter, brown sugar and white sugar together. Add the egg and vanilla and beat until incorporated. Add the flour, baking powder, salt, and graham cracker crumbs. Mix until everything comes together and there are no streaks of flour in the dough. Press 2/3 of the dough into the prepared pan, and press to form an even layer. Reserve the remaining 1/3 dough. Place the chocolate bars over the dough (I couldn’t quite make all of the chocolate fit – but I got most of it in). Melt the peanut butter in the microwave or in a small saucepan until it is just runny. Drizzle over the chocolate and spread to form an even layer. Top with the Fluff, spreading out (as far as possible) to from an even layer. Take the remaining 1/3 of the dough and press it out on a piece of parchment to an 8×8 square and carefully lay it over the top of the Fluff (or do it in 4 pieces which is easier). Bake for 30-35 minutes. Allow to cool before attempting to slice. I am so, so sad to have missed all these desserts. The potato salad also sounds pretty awesome.